You spend your workday caring for others. You carefully plan activities that will suit your residents and lead those groups with energy and smiles. You encourage your staff members and educate other departments on how to get more involved with the residents you serve. You rally volunteers and keep family members happy. In between all that, you complete paperwork, make staff schedules and decorate the community room for the next party. Then, you head home to care for your family. One important question - who takes care of you? Only on day 4 and already feel stressed. Not enough staff, only me to manage 5 areas (2 are memory care). I am only in training but my head feels frazzled already! This happened to me. No one told me what to do, just gave me a half full activity cupboard and said make posters, activity calendars and don't leave anyone out. It's really really stressful. Golden carers is a god send. They have loads of quizzes that help get you talking. I start with a small table of people who sit colouring every day and just go through nursery rhymes. They love remembering them. Proverbs quizzes go down well too. You'll get there. It's really difficult having absolutely no guidance and not enough staff but it's a very fullfilling job. Take your time, get to know your residents and you'll find your own way to do it. Hi Jenny, I feel for you, it is hard when you don’t have time for yourself. However, don’t continue in this way or you will burn out and won’t be able to work. You have to be brave and ask for help from your peers or state your case to management. You will enjoy your work better if you are not under stress. Please, seek help before it is too late. I must admit that I do too, Glenda. 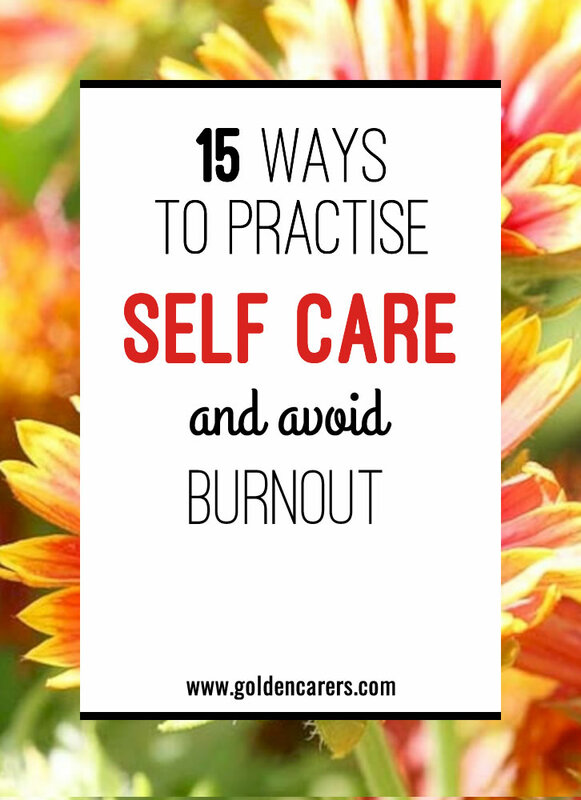 In fact, I think most Activity Professionals struggle with putting themselves first every once in awhile - the fact that we are great caregivers makes us good at our jobs but not so good at caring for ourselves. I hope you can make small steps to taking better care of yourself this month and this year - you are worth it! I think I'm hitting a burn put at the moment. I've been moody all weekend, unmotivated let week now my skin is dry and breaking out and I have ulcers in my mouth. I've only been in the job 5 weeks. The first months of a new job can be especially stressful. I'm so proud of you for noticing and listening to your body. You can't give your all to your residents when you don't have anything to give. Good for you for taking time for yourself - I hope you noticed a difference in your energy and health, and that you make self-care a part of your regular routine. Cheering you on! Without Golden Carers to lean on l would have burnt out months ago. I like to easy steps for preventing burnout and at the present l am making up a look after yourself sheet for families, caring for a loved one with dementia, so that will help me out there also. Your site gives new ideas to old activities, and the quizzes for my group are wonderful. They fill in that time before lunch arrives and all the clients are worrying about is lunch. Thanks again to all who have part in the wonderful site of Golden Carers. I'm so thankful you find community, validation, and value here at Golden Carers, Lesley! Your residents are lucky to have you - and remember to take time to care for yourself too.